"You run the house, not the children. Get back your control and power easily with little effort". Are you experiencing regular tantrums from your child? Do you argue about behaviours? Do you feel your child doesn't listen to you? Is there a problem with your child going to bed or staying in their bed? Throughout her two decades of experience, family therapist Karen Phillip has seen many couples having difficulty dealing with their young children and many adults having issues originating from their parents. As a mum of three children, Karen understands the emotion of raising your children. 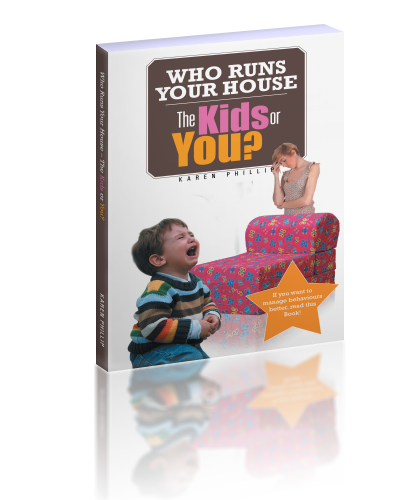 In her attempt help parents raise healthy, happy children that can go on to lead balanced adult lives, she presents Who Runs Your House – The Kids or You? Written for parents who desire no-nonsense advice, this book provides simplistic and effective guidance that is easy to read and implement. Parents can turn to Who Runs Your House – The Kids or You? when they aren’t sure what expectations they should have, what boundaries are fair, what behaviours are acceptable and what consequences are appropriate. In twenty two easy-to-understand chapters, Phillip teaches parents ways to ensure your children listen to your requests while ensuring conflcit is removed from the relationship and home. Written with parents, stepparents and grandparents in mind, Who Runs Your House - The Kids or You? provides realistic strategies to maintain balance within the home for happier children and parents without the normal conflict we so often expereinces. While the book is a wonderful Parenting guide, it is also a book regarding relationships. Relationships between parents and children and the relationship between the parents. The dad’s role is discussed, as is the difficulty of raising step children, the issue of ADHD, sibling rivalry plus the importance of children’s diet and activity.